here are two ways to classify joints: on the basis of their structure or on the basis of their function. The structural classification divides joints into bony, fibrous, cartilaginous, and synovial joints depending on the material composing the joint and the presence or absence of a cavity in the joint. The bones of fibrous joints are held together by fibrous connective tissue. There is no cavity, or space, present between the bones and so most fibrous joints do not move at all, or are only capable of minor movements. There are three types of fibrous joints: sutures, syndesmoses, and gomphoses. Sutures are found only in the skull and possess short fibers of connective tissue that hold the skull bones tightly in place (Figure 19.23). Figure 19.23. 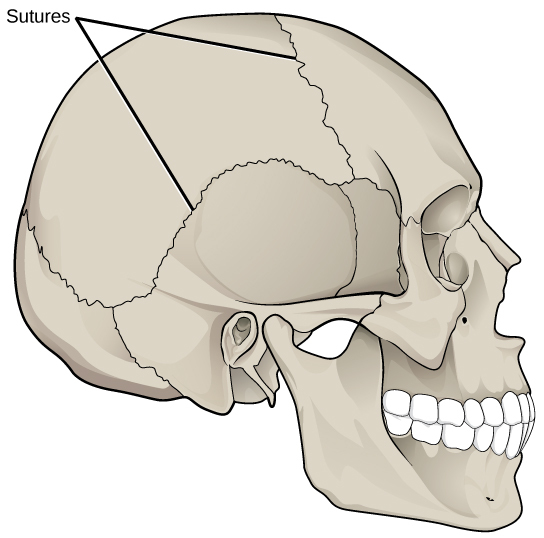 Sutures are fibrous joints found only in the skull. Syndesmoses are joints in which the bones are connected by a band of connective tissue, allowing for more movement than in a suture. An example of a syndesmosis is the joint of the tibia and fibula in the ankle. The amount of movement in these types of joints is determined by the length of the connective tissue fibers. 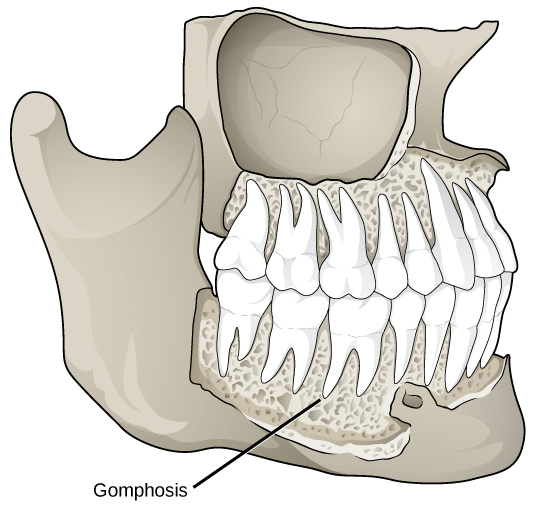 Gomphoses occur between teeth and their sockets; the term refers to the way the tooth fits into the socket like a peg (Figure 19.24). The tooth is connected to the socket by a connective tissue referred to as the periodontal ligament. Synovial joints are the only joints that have a space between the adjoining bones (Figure 19.25). This space is referred to as the synovial (or joint) cavity and is filled with synovial fluid. 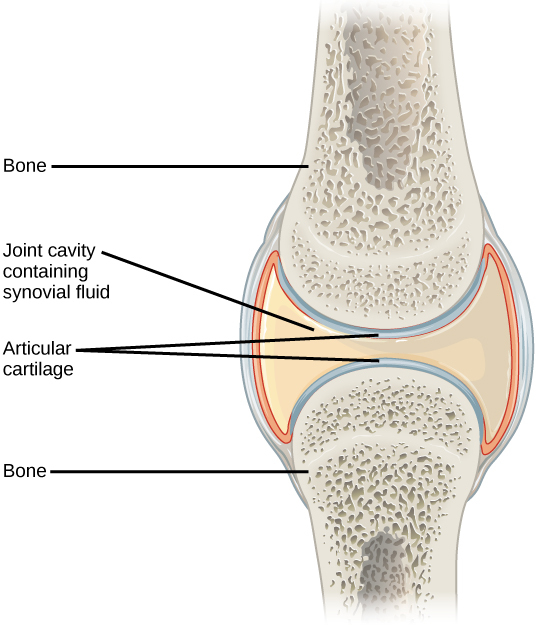 Synovial fluid lubricates the joint, reducing friction between the bones and allowing for greater movement. The ends of the bones are covered with articular cartilage, a hyaline cartilage, and the entire joint is surrounded by an articular capsule composed of connective tissue that allows movement of the joint while resisting dislocation. Articular capsules may also possess ligaments that hold the bones together. Synovial joints are capable of the greatest movement of the three structural joint types; however, the more mobile a joint, the weaker the joint. Knees, elbows, and shoulders are examples of synovial joints. The functional classification divides joints into three categories: synarthroses, amphiarthroses, and diarthroses. A synarthrosis is a joint that is immovable. This includes sutures, gomphoses, and synchondroses. Amphiarthroses are joints that allow slight movement, including syndesmoses and symphyses. Diarthrosesare joints that allow for free movement of the joint, as in synovial joints. Gliding movementsoccur as relatively flat bone surfaces move past each other. Gliding movements produce very little rotation or angular movement of the bones. The joints of the carpal and tarsal bones are examples of joints that produce gliding movements. Angular movements are produced when the angle between the bones of a joint changes. There are several different types of angular movements, including flexion, extension, hyperextension, abduction, adduction, and circumduction. Flexion, or bending, occurs when the angle between the bones decreases. Moving the forearm upward at the elbow or moving the wrist to move the hand toward the forearm are examples of flexion.Extension is the opposite of flexion in that the angle between the bones of a joint increases. Straightening a limb after flexion is an example of extension. Extension past the regular anatomical position is referred to as hyperextension. This includes moving the neck back to look upward, or bending the wrist so that the hand moves away from the forearm. Abduction occurs when a bone moves away from the midline of the body. Examples of abduction are moving the arms or legs laterally to lift them straight out to the side. Adductionis the movement of a bone toward the midline of the body. Movement of the limbs inward after abduction is an example of adduction.Circumduction is the movement of a limb in a circular motion, as in moving the arm in a circular motion. Some movements that cannot be classified as gliding, angular, or rotational are called special movements. Inversion involves the soles of the feet moving inward, toward the midline of the body. Eversion is the opposite of inversion, movement of the sole of the foot outward, away from the midline of the body. Protraction is the anterior movement of a bone in the horizontal plane. Retractionoccurs as a joint moves back into position after protraction. Protraction and retraction can be seen in the movement of the mandible as the jaw is thrust outwards and then back inwards. 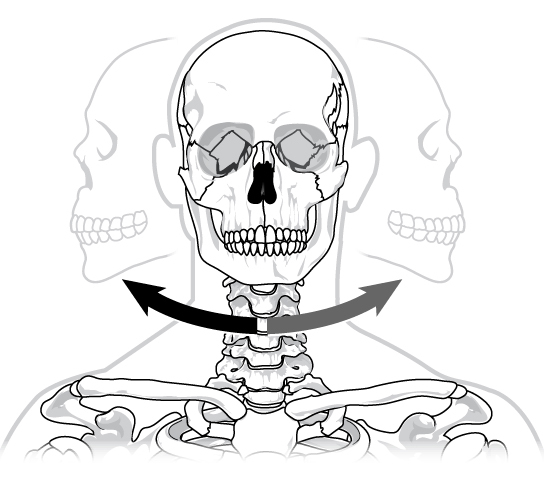 Elevation is the movement of a bone upward, such as when the shoulders are shrugged, lifting the scapulae. Depression is the opposite of elevation—movement downward of a bone, such as after the shoulders are shrugged and the scapulae return to their normal position from an elevated position.Dorsiflexion is a bending at the ankle such that the toes are lifted toward the knee. Plantar flexion is a bending at the ankle when the heel is lifted, such as when standing on the toes. Supination is the movement of the radius and ulna bones of the forearm so that the palm faces forward. Pronation is the opposite movement, in which the palm faces backward. Opposition is the movement of the thumb toward the fingers of the same hand, making it possible to grasp and hold objects. Synovial joints are further classified into six different categories on the basis of the shape and structure of the joint. The shape of the joint affects the type of movement permitted by the joint (Figure 19.26). 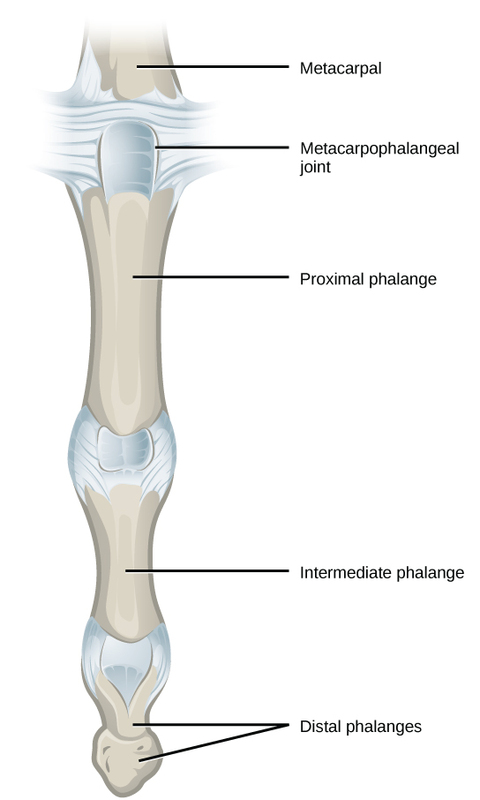 These joints can be described as planar, hinge, pivot, condyloid, saddle, or ball-and-socket joints. Planar joints have bones with articulating surfaces that are flat or slightly curved faces. These joints allow for gliding movements, and so the joints are sometimes referred to as gliding joints. The range of motion is limited in these joints and does not involve rotation. 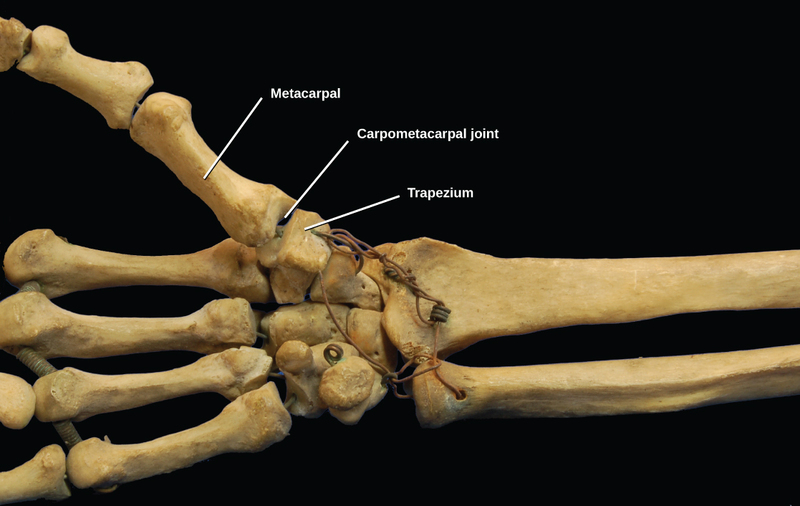 Planar joints are found in the carpal bones in the hand and the tarsal bones of the foot, as well as between vertebrae (Figure 19.27). In hinge joints, the slightly rounded end of one bone fits into the slightly hollow end of the other bone. In this way, one bone moves while the other remains stationary, like the hinge of a door. The elbow is an example of a hinge joint. The knee is sometimes classified as a modified hinge joint (Figure 19.28). Pivot joints consist of the rounded end of one bone fitting into a ring formed by the other bone. This structure allows rotational movement, as the rounded bone moves around its own axis. An example of a pivot joint is the joint of the first and second vertebrae of the neck that allows the head to move back and forth (Figure 19.29). The joint of the wrist that allows the palm of the hand to be turned up and down is also a pivot joint. Figure 19.29. The joint in the neck that allows the head to move back and forth is an example of a pivot joint. Condyloid joints consist of an oval-shaped end of one bone fitting into a similarly oval-shaped hollow of another bone (Figure 19.30). This is also sometimes called an ellipsoidal joint. This type of joint allows angular movement along two axes, as seen in the joints of the wrist and fingers, which can move both side to side and up and down. Saddle joints are so named because the ends of each bone resemble a saddle, with concave and convex portions that fit together. Saddle joints allow angular movements similar to condyloid joints but with a greater range of motion. An example of a saddle joint is the thumb joint, which can move back and forth and up and down, but more freely than the wrist or fingers (Figure 19.31). Ball-and-socket joints possess a rounded, ball-like end of one bone fitting into a cuplike socket of another bone. This organization allows the greatest range of motion, as all movement types are possible in all directions. 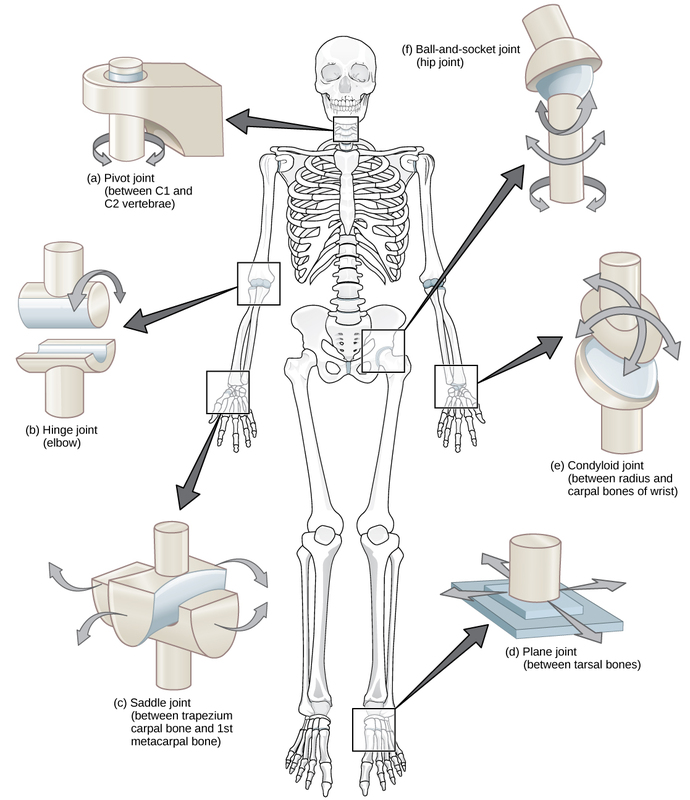 Examples of ball-and-socket joints are the shoulder and hip joints (Figure 19.32). 2.The movement of bone away from the midline of the body is called ________. 3. Which of the following is not a characteristic of the synovial fluid? 4. 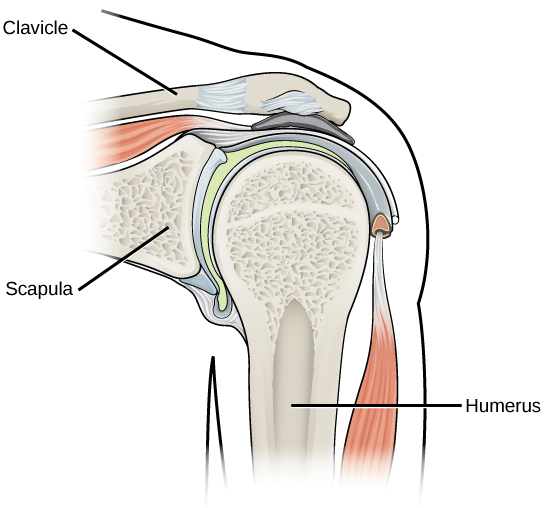 The elbow is an example of which type of joint? 5. What movements occur at the hip joint and knees as you bend down to touch your toes? 6. What movement(s) occur(s) at the scapulae when you shrug your shoulders? 19.3 Joints and Skeletal Movement Copyright © by laesoph. All Rights Reserved.